Cavaliers generally don’t need bathing very often – perhaps every 6 weeks or so. Since Cavalier King Charles Spaniels are small dogs, and their coats are traditionally never clipped, it’s unnecessary to pay a professional groomer to bathe your dog. Follow these simple steps to give your dog a bath at home! First, collect the various materials you’ll need to have everything close at hand before you begin. Grab your Cavalier King Charles Spaniel’s comb or brush, pet shampoo, several clean towels, some cotton balls, and a few tasty treats. If your Cavalier is still a puppy, you’ll want him to learn that bath time is nothing to worry about, so take time to help him adjust. To a small Cavalier King Charles Spaniel, the prospect of being lifted to the kitchen sink and doused with water may be more frightening than you think. Keep your voice calm and soothing, talk your new puppy through the process with lots of praise, and of course, a few well-timed treats. It will pay off in the long run if your Cavalier King Charles becomes a happy participant, rather than becoming frightened or resistant. Begin by grooming your pet’s coat to remove loose dirt, mats and snarls. Tangles in your Cavalier’s coat can become nearly impossible to remove after his coat is wet! This is also a good time to examine your dog’s skin for any bites, scrapes, or irritations you may wish to bring to your vet’s attention. Cavalier King Charles Spaniels are the perfect size for bathing in the kitchen sink. However, if there’s any chance your pet won’t stay calm and obedient, then don’t take a chance that he will jump away from you and fall from your kitchen counter to the floor. If your pet is too wiggly, bathe him in the bath tub instead. Place a rubber mat or a small wet towel on the bottom of the sink or bath tub. This will keep your Cavalier King Charles Spaniel from slipping on the porcelain and will help him feel more at ease. Test the water temperature yourself before beginning to wet down his coat. If you are using the kitchen sink, the spray hose is a great convenience. If you’re bathing your Cavalier Spaniel in the bath tub, then you may want to use a plastic pitcher. Rub in a shampoo specifically designed for dogs. Don’t use your own personal shampoo. A good quality dog shampoo takes into consideration that a dog’s skin has a different Ph level than their human master’s skin. If your dog has any kind of skin irritation or similar condition, consult your veterinarian about the right shampoo for your pet. Avoid getting water in your Cavalier King Charles Spaniel’s eyes and ears. Gently placing cotton balls in his ears will help keep his inner ear dry. Instead of wetting down your Cavalier’s face, use a warm, wet washcloth to carefully wipe his snout and the area around his eyes. Rinse all shampoo out of his coat thoroughly and wrap him in a clean towel . Change towels as needed to blot up as much water as possibly from your Cavalier’s coat. Then you can either let your pet “air dry” or use a blow-dryer to speed up the process. If you choose to blow-dry your Cavalier, use a low fan setting and cool temperature setting to avoid burning his skin. 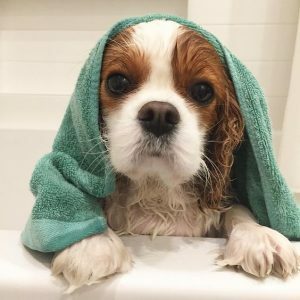 Praise him and give your squeaky clean Cavalier King Charles Spaniel a treat as a reward for good behavior!